“In my young days bonnets were bonnets, and not little dress-caps, quivering in a very precarious situation, pinned to the twist of the hair. They are not pinned? Oh, you needn’t tell me! There is nothing but pinning that can induce them to remain in place. When I was a girl, things were different; then the bonnets rested on a secure foundation. Fashion? Well, suppose little bonnets are the fashion; is that any reason why a large red face, round as a full moon, should be ‘set out’ by a tiny gauze bonnet about the proper size for Titania. Oh, don’t talk to me! 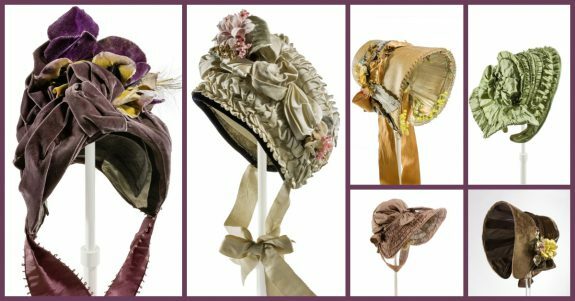 If you really want to see what I think is a respectable proper bonnet for a lady, hand me that yellow bandbox at the end of my closet-shelf. 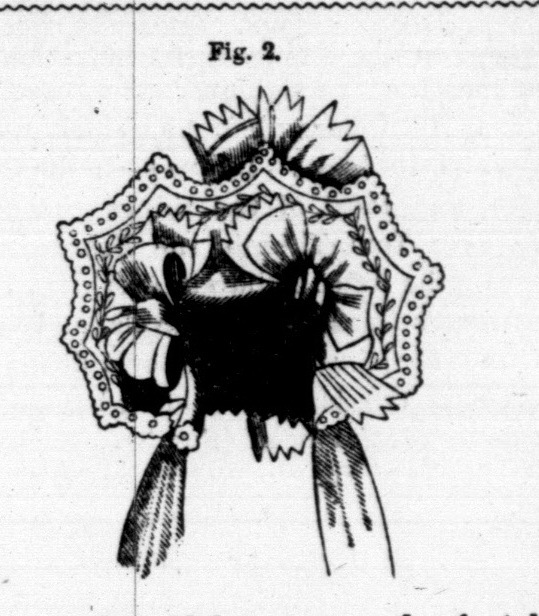 There, that bonnet (Fig. 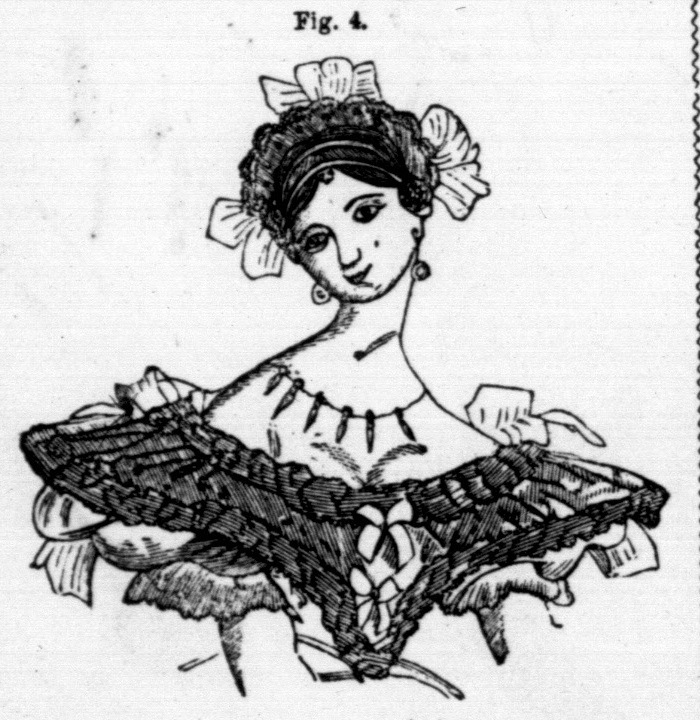 1) was made from the highest fashionable authority, Godey’s Lady’s Book for January, 1834! Looks faded? Of course, it does; you would, too, if you had been shut up in a bandbox for more than twenty years. What do I keep it for? Because I like to have some proof that women were not always the foo–. Well, I don’t want to be uncharitable. 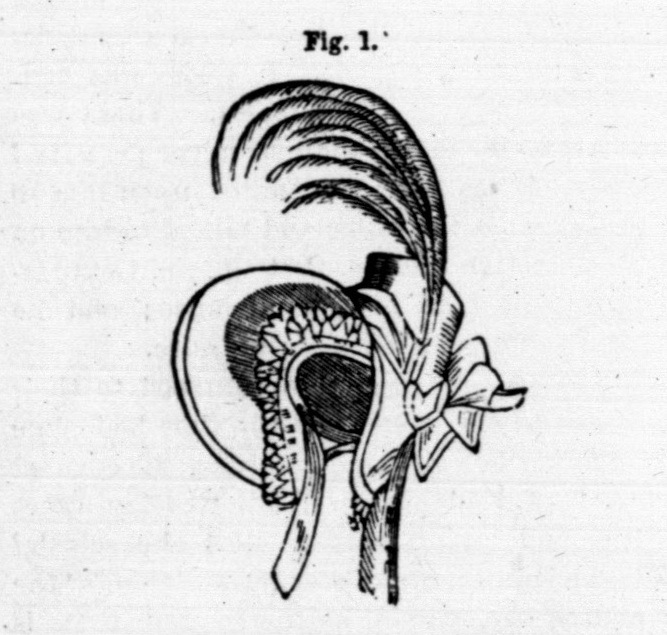 But, I do wonder Mr. Godey will encourage them in their nonsensical ways; of course, they’ll wear little bonnets as long as they have pages of pretty ones to choose from. And finishing her long indignant speech with a sigh over my want of taste, my dear Aunt Peggy left me to look over her Godey. I did look! I have seen the Crystal Palace, and most of the things therein! 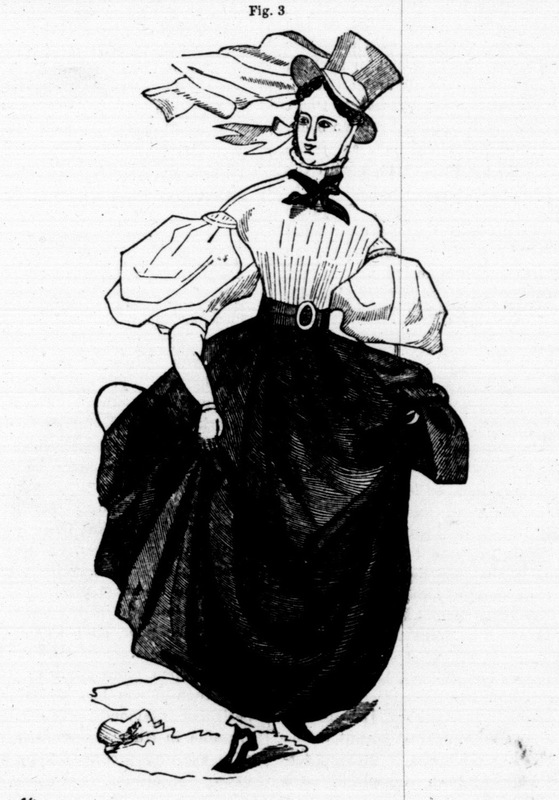 I have seen Tom Thumb, the Bearded Lady, Kossuth, the Aztec Children, President Pierce, Parkinson’s Gardens, the Ravels, and various fashion -plates; but I never—never did see such a figure as the lady in a riding-habit I found in this wonderful book (Fig. 3). Such a collar! I believe they called them by the very appropriate name of ‘chokers;’ such a belt, and such a perfect dinner-plate of a buckle; such sleeves, swelling out from under a minute cap, with a defiant puff, like a—Ahem! garment on a clothes-line in a high wind; or, to speak more poetically, a rose bursting from the green the bud inclosed it with; such a whip for a lady; oh, I pity her poor horse if she is as independent and high-tempered as she looks. Such a hat and veil; of what fabric can that veil be composed to float in such an eccentric sweep? Such an air and attitude; such, in short, such a tout ensemble! Don’t she look ‘peart,’ with her head thrown back, and her feet in a polka position, as if she meant to “dance up to that man with the goose’s on his buttons there,” and ask him to please to place her on her horse. To judge from appearances, Lady Gay Spanker must have been quite a mild, unassuming person compared with this fair equestrian. “Look on this picture and on this” (Fig. 4). From our defiant rider to this lovely ball-room belle. Mark the modest arrangement of the hair, and the bows blushingly putting forward their claims to notice. (Beaux are such modest arrangements.) Mark the necklace, composed apparently of small spikes, which can, I suppose, be converted into deadly weapons on occasions. Mark the breadth of shoulders, the cape of black lace, the full sleeves, and the bows. Did ladies widen their doorways in 1833 (I have Aunt Peggy’s Godey for 1833 now) for their guests to pass in without diminishing their “breadth of effect?” Look at the languishing air of our “’33” belle, and compare her with the “’34” equestrian. But, how I am wandering off from my bonnets! The fact is, fashions are so entirely different from what they were some twenty or thirty years ago, that I sit with the Book before me, in blank amazement, and wonder what we shall wear next. And turn the pages in haste, oh! That they were in very good taste, oh! We wear the same again, oh! That they are just the thing, oh!